This is our first time together in Toronto. It was very special for us to be able to unite in our homeland. Situated in the intersection of queen and spadina, the heart of Toronto and the city's fashion district we engaged ourselves to a mini photo shoot. Chilly as a December afternoon could be in downtown Toronto, Nicola managed to pull off her 3 inch black booties with her trendy half and half houndstooth patterned/ black skinnys that she made back in bella Sicilia, and to keep the look stylish instead of wearing an oversized jacket that may cover her intended look, Nicola decided to layer sweaters together keeping her overall outfit intact. 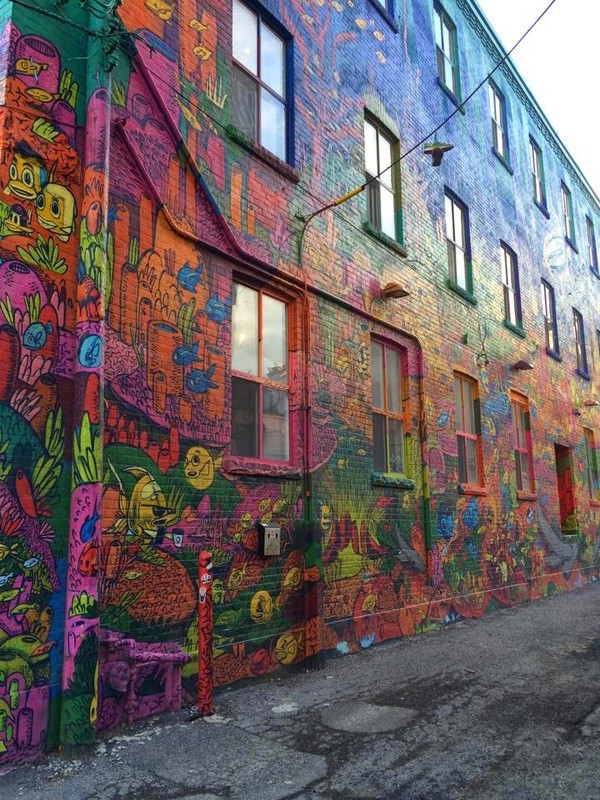 Toronto is a very creative and imaginative city, we as Torontonians embrace our muliti cultural and innovative artists. 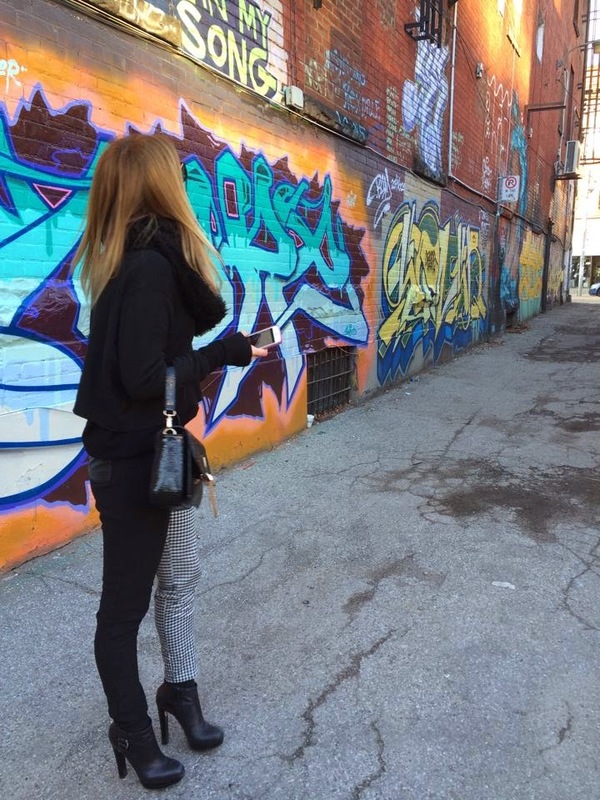 Therefore, we decided to walk around the back alleys of queen and spadina showing you the beautiful art display our city has to offer. 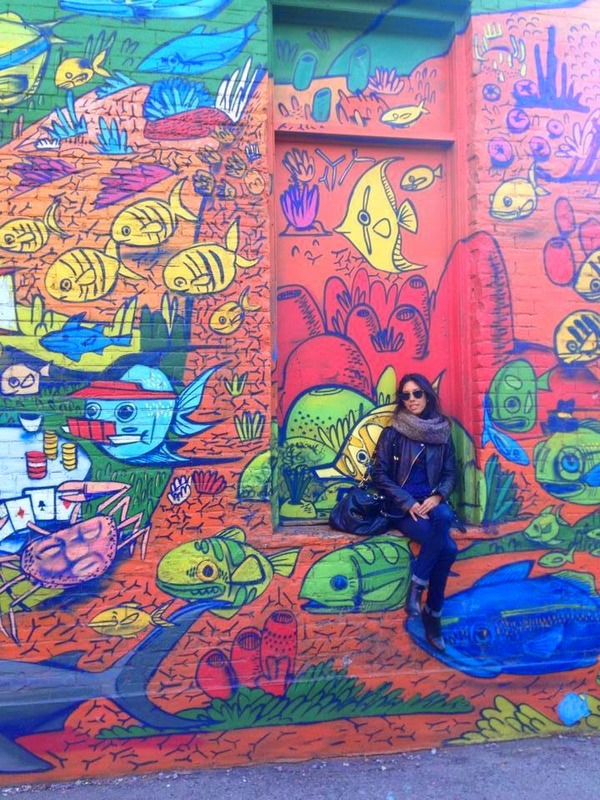 Bold colours and interesting creatures are portrayed on the walls making us wonder the stories behind them. Stephanie kept her look cool, by throwing a pair of dark denim adding a black dress shirt and combining it with a navy laced top, putting her favourite leather jacket, to finish it off she accessorized by adding a circle faux fur scarf to block out the harsh winds. Although, we didn't have enough time together we surely enjoyed our day spent in our city. The next time we're back in Toronto, we hope that it will be much warmer so we can display our amazing outfits and really show our amazing city.